Business, #amazonkindlebooks, #booklaunch, #onlinewriting, #soyouthinkyoucanwrite, #soyouthinkyoucanwrite? Julia's book, So You Think You Can Write? The Definitive Guide to Successful Online Writing, just launched TODAY in Amazon, on print and Kindle! 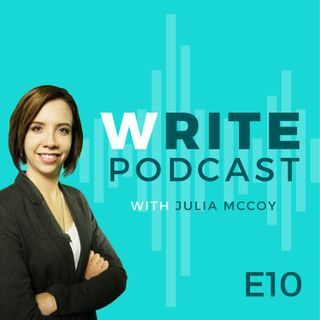 In Episode 10 of The Write Podcast, Julia reads a chapter of her book. Learn about how storytelling is a fundamental of all great online writers; which companies excel in online stories; and hear about Julia's first early years as a content marketer. To buy the book, go to ... See More http://www.amazon.com/Think-Definitive-Successful-Online-Writing-ebook/dp/B01EGAAZB8/ or type in http://bit.ly/juliamccoy. See more podcast episodes at https://expresswriters.com/write-podcast/.